I placed here some Polish tappers (who wanted to be here) in alphabetical order. Inspirations: Chopin, beer A.K.damm, long-legs blonde, Polish autumn, poems of Dariusz Bojda, tourists near Picasso Museum in Barcelona... Two tunes You can download at www.stickcenter.com. Description: Spector Legend 5 classic (strojony EADGC), Spector Legend 6 classic (strojony HEADGC lub EADGCF). Check out MySpace site: http://www.myspace.com/bassgk. Inspirations: W.A.Mozart, F.Chopin, L.v.Beethoven, J.S.Bach, Y.Malmsteen. Instrument: Mobius Megatar MaxTapper, GMR 6 Bassforce Single Cut. Description: 10 strings Warr, tune: Deep Matched Reciprocal, measure 36''. Description: 10 string Warr, neck set-in. Tuning: 5th tuning and one 3th major at the solo side, color: red. Inspirations: Trey Gunn, Tony Levin, Markus Reuter, Kuno Wagner, Michael Gosh. Instrument: 5 string bass and luthier copy of Warr Guitar(Magnus Krempel). Inspirations: Trey Gunn, Tony Levin, Pastorius i Meeshel. Instrument: Guitars: Gibson Les Paul and Fender Telecaster (standard tunning). Description: Style: Blues, rock, tapping solo. Partyzant had been played with famous Polish bands like "Dzem" and "Zdrowa Woda". Instrument: Grand Stick luthier copy. Description: 10 string (1992), stickup, truss rod, old bridge type, baritone tuning, strings: medium. Description: Standard tunning (E, B, G, D, A, E), Zefir uses two-handed tapping and picking techniques as well. 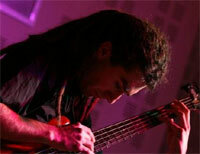 Music: improvised avant-garde music, Zefir plays two-handed tapping with crossed hands. Description: Born 15th of July 1981 in WELS(Upper Austria), half Polish, half Austrian. Live in Vienna, in 2003 has recived scholarship for BERKLEE COLLEGE OF MUSIC.